To vote in the May 6 Referendum, you must be a registered voter in a Decatur Township precinct. Although this is the Primary Election, you do NOT have to declare a party in order to vote on the Referendum. There will be a Democrat ballot, a Republican ballot, and a non-partisan ballot available and it is your choice which one is given to you. I have heard all sorts of stories from folks who came into the polling location on Election Day, who swore they were registered by the BMV or someone at a Fair, but whose registration never made it into the books. Those folks only had one option - vote a provisional ballot and bring proof of registration to the County Election Board - likely their vote did not get counted. New rules make getting registered in a voter registration drive quite tricky. The best way to be sure your registration gets properly put onto the voter rolls, is to go to the Marion County Voter Registration office in person (City-County Building, 1st Floor), print off a registration form from the State's website and mail it in to the Marion County Voter Registration office yourself, or sign up online. 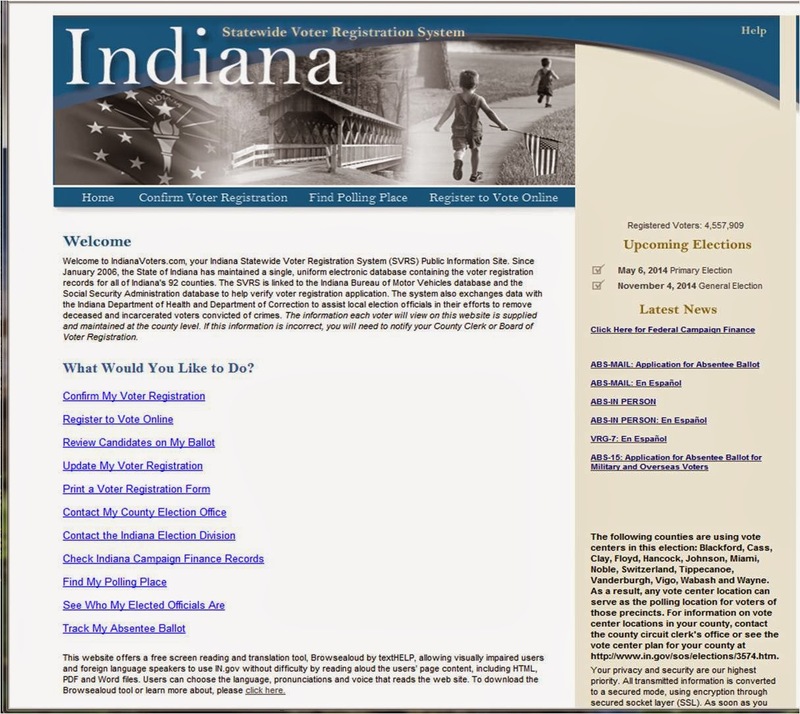 On the home page you can check to see if you are registered at your address and with your current name, you can register to vote in Indiana, you can change your registration to reflect the fact you changed your address or name, you can find your polling place, and you can preview the offices and names on the ballot. All you will need is an Indiana Drivers License or ID Card with your current address on it. #2 Check that your registration got into the system -- or -- that it is current and up to date. Do both before April 7. Because the May 6 Referendum would fix a specific extra tax rate, you can get a pretty good idea how much passage of the referendum would cost you. The extra rate requested is 0.2986 dollars per $100 of assessed value. Assessed value is the amount of money the City/County thinks your house and property are worth. That will likely creep up over the next 7 years - which is the length of time the extra tax would be in effect. If the school system got the referendum and it wanted it in year 8 as well, then it would have to put another referendum on the ballot in 2021. Here's how you get a good estimate of the cost to you by using a little math and your last property tax bill. Pull out your last property tax bill (pay 2013) and look at the long page titled "Special Message To Property Owner". In Table 1: "Summary of Your Taxes", locate line 3. "Equals subtotal of net assessed value of property". In the far right column of Line 3, under the heading "2013", is the important dollar value for your property that is used in this calculation. Multiply that important dollar value by 0.003 - I used a calculator for mine. The resulting number is the extra dollars you would have to pay if the referendum is passed. Now, if you own homestead property larger than one acre, you will find that the extra tax you calculated is higher than shown in these examples, because the value of that extra land does not get any deductions. By following the calculation method I noted above, you'll get a better representation than by using the table supplied by the District. Rental residential property and farmland have a property tax cap of 2%. So, increasing the tax rate by 0.3% would increase the tax bill by 15%. Commercial and industrial property have a property tax cap of 3%. So, increasing the tax rate by 0.3% would cause an increase in those tax bills by 10%. I don't know how I will vote on the May 6 Referendum that would increase property taxes for the benefit of the Decatur School District (MSD Decatur Township). I do, however, know that I resent having to make this decision. Why, of course, through unrestrained, extravagant, spending by former Superintendent Don Stinson, his #1 guy, Jeff Baer, and the Decatur School Board - primarily former member Don Huffman and current members Larry Taylor, Judy Collins, Cathy Wiseman, and Dale Henson. Most folks are aware of are all the new school facilities. What most do not realize is that in 2002 a respected accounting firm, Umbaugh and Associates, analyzed the ability of the community to handle various debt loads. That year the total debt stood at $25.5 Million. They concluded that by 2010, Decatur Schools could grow the debt to $80.9 Million and the community would be in a good position to afford the taxes. Instead, our 'trusted' leaders sank us in $266.7 Million in debt by 2009. This is a crushing debt load - one we continue to pay dearly for to this day. It is also the primary cause of any need for passage of the upcoming Referendum. To pay for all the School Building projects, we were told our property taxes would rise the equivalent of a weekly meal at McDonalds. Instead, our taxes more than doubled. Thank goodness for the property tax caps that protected us from the full brunt of our wayward School Board. Not content with all that rubber stamped, irresponsible spending, the School Board also went on a property buying spree. They bought the old Concentra Building (Southwest Pavilion) across Kentucky Avenue from the High School and hundreds of acres of land for which there was no immediate need. In most instances, they did not get the two appraisals required by State Law in order to protect the taxpayers from malfeasance. In one case they got a single appraisal and then paid 40% more for the property - another clear violation of State Law. But, they didn't care. Somehow the taxpayers were just the chumps at the other end of the debt. The District took out a short term loan, usually paid back once tax money is distributed by the State. But, they didn't pay the loan back when they got the tax proceeds. Instead, they spent the tax money and only paid interest on the loan. That was until the stuff hit the fan and they could no longer stay on that course. So, they floated new debt to pay off the short term loans. Still not content, they raised Administrator salaries with abandon. Most Administrators saw their salaries double, the Superintendent saw his more than triple. This caused the escalation of Administrator salaries in Marion County and Central Indiana - as the Superintendents manipulated their Boards and the situation to grow their salaries over that puny District in Decatur Township. Every grossly exaggerated salary at the administrator level directly impacts how many teachers can be hired and thereby class size. By 2009, Central Office expenses had ballooned to over 10% of all General Fund expenses - far outstripping other Marion County Districts. Hyperinflated salaries weren't enough, either. Golden parachutes, above and beyond the tidy nest eggs the District already paid for, were devised for 5 'retiring' Administrators. The total added up to nearly a Million Dollars. Even today, they also either receive free health insurance or its cash equivalent until they and their spouses reach the age of 65 and qualify for Medicare. The cash equivalent this year is over $19,000 per family. Money that could be used better, for sure. In the case of the loans and golden parachutes, Superintendent Stinson acted unilaterally - meaning without the approval of the Board. Both times, when the actions were aired in public, the Board retroactively approved his actions. I could add to this the hiring of relatives, catered meals before each Board meeting, and other small extravagances engaged in by the Board. I could go on about the redistricting, causing the need to transport children to the opposite ends of the Township instead of to their closest elementary school, driven by the fact that poor school performance threatened the receipt of federal funds linked to 'No Child Left Behind'. Since its peak, debt has been going down and, of all the excess property, at least the Concentra Building (Southwest Pavilion) has been sold. Current debt load is just shy of $140 Million. Still, this leaves our community with the highest tax rate for School debt of any District in Marion County, and much larger than our nearest neighbors in Hendricks and Morgan Counties. That's how we got to this point, where now the community must weigh the pros and cons of approving an additional property tax through a referendum. Is it throwing good money after bad, or will it mend what the School Board broke? A friend recently asked me how much the School Board members make. I don't know the current amounts, but they generally get about $2000 per year plus a some amount for each meeting they attend - perhaps amounting to $5000 per year each. My friend suggested that the least the Board could do is forsake any compensation for as long as they remain Board Members. That makes a lot of sense to me. I'd also like to see each of the four active Board members who are responsible for our financial mess, Taylor, Collins, Wiseman, and Henson, stand up in a public meeting and apologize for putting us in these straits. How else can we be sure they will not just spend the new money with the same lack of fiscal responsibility they spent all the other money we taxpayers have sent their way. The least they can do is have the common decency to not run for election again. With this entry I am starting a series on the May 6 Decatur Schools Referendum. The District administration says that a $ 0.2986 per $100 net assessed value addition to the property tax bills would generate about $3.85 million per year for them. I have not made up my mind on how I will vote on this measure. I do, however, see many issues that the community needs to discuss, as each voter decides their position. Harm can come from this referendum. Harm can come if it is not approved. It will take a few entries to lay out what I see as the issues. The next entry will be on accountability and how we find ourselves in this predicament. Next I will show taxpayers how to easily figure what this referendum would cost you a year and how to register to vote and be sure you are registered in time for May 6. I'll follow that with individual entries addressing the arguments 'for' the referendum, arguments 'against', and issues that do not neatly fall in either camp but should be considered. It is important to mention that there is a new Administration in Decatur. Dr. Matt Prusiecki, Superintendent, and Kirk Farmer, CFO, have been transparent and happy to share whatever numbers and information I have requested. This is a breath of fresh air, for sure. I am positive that this transparency and accessibility applies to each resident of our community. If you want to avail yourself, there is information on the District website, phone numbers, an FAQ section (which I will post as a link in the sidebar to this blog), and a list of referendum presentations by Dr. P.
I am sure I will leave things out. Feel free to add your own thoughts and points of view in either the comments section or by sending them on to me at hadenoughindy@gmail.com. This referendum is very important, no doubt. If you do nothing else, be sure you get registered and be sure you vote on May 6. You don't get to voice an opinion on May 7 if you don't vote on May 6. One race on the slating card for tomorrow's Marion County Democratic Convention clearly demonstrates everything that is wrong with the County Party. Slating, of course, is meant to eliminate any Primary contest. The excuse for our County being the only one in the State and nearly the only one in the Country to slate candidates for the spring ballot is that folks 'who know the candidates best' make the better decision over the electorate. Meanwhile, the County Chairman is busy recruiting temporary Precinct Committeemen, Vice-PCs, Ward Chairs, and Vice-WCs to vote in tomorrow's slating exactly like he wants them to. The race for County Clerk is important to everyone. The Mayor's job is the only one that is more demanding and more extensive than is that of the Clerk. Beth White, the current Clerk, has done a phenomenal job in her tenure; but term limits bar her from continuing. At her side has been the able Myla Eldridge, for many years the person actually running the elections. Eldridge is clearly the best candidate. She knows what the job entails and has excelled at it. She is exceedingly competent - exactly what you want in a public servant in a demanding job. While under her watch, Eldridge and White have improved the election process leaps and bounds. The Clerk also has responsibility for all of the records of the Superior Courts, marriage licenses, probate, child support, and campaign finance. It will be a nightmare if any of these gets messed up. Eldridge's opponent is the current Coroner, Frank Lloyd. He has been totally incompetent. He started his tenure by firing Pathologists who later won a discrimination lawsuit against the City because of it. Autopsies take too long. Getting a death certificate from his office is a challenge. Body parts, unmentionable ooze, stench and indignity of human remains have been cited under his watch. He hasn't shown up at Council hearings to present and defend his budget for years. For some reason, he is the only one who gets a pass in being held accountable. If elected, Lloyd would either have to be a ghost employee or the County would face severely damaged elections, court proceedings, and messed up child support issues. He has been an utter failure as Coroner. Hopefully for all of us, there will be fewer hand selected voters at tomorrow's slating and more elected PCs and V-PCs who will vote for good, capable, government by voting for Myla Eldridge.